Landslides and flash flooding following heavy rainfall on the Indonesian island of Sumatra have left at least 21 people dead, officials say. Eleven of the dead were children buried when mud and water engulfed their classroom in the village of Muara Saladi in North Sumatra province. Another 10 people are missing at the site. 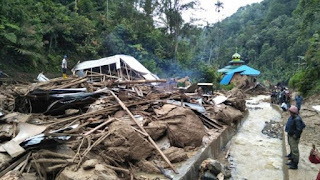 More than 500 homes in the provinces of North and West Sumatra have been damaged. The deadliest incident was at the Islamic village school in Muara Saladi in Mandailing Natal district, which borders West Sumatra province. Children were studying on Friday afternoon when a nearby river overflowed and brought down their classroom wall.